This lovely 2 bedroom townhouse with sea views sits on the edge of a private development in the village of Asprouliana. It is just a short drive from the beach resort of Georgioupolis and the beautiful lake at Kournas. With a large communal swimming pool, kids pool, private terrace and seating areas this well equipped villa is ready to move into. 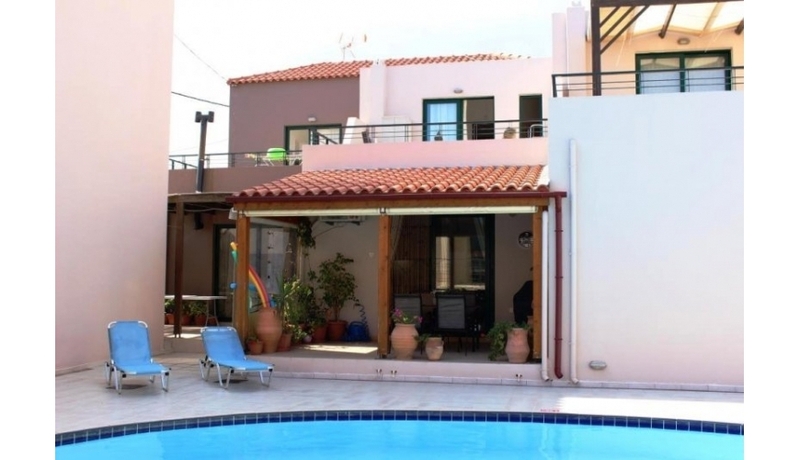 This very well maintained complex of holiday apartments built in 2006 has extensive paved terraces, a swimming pool shared between 6 villas with a separate children's pool. Part of a large development with several pools this is a lovely community comprising many different Nationalities. It is situated a short 10 minute stroll from the nearest beach and is just a 5 mins drive to both Kavros and Georgioupolis — with their wide range of tavernas, shops and of course golden beaches. This well equipped 2 story townhouse has a very spacious open plan kitchen, living and dining area. The living area has a feature corner fireplace. Patio doors go from here to the covered terrace & paved patio areas overlooking the pool. Steps lead down from here to the pool & the surrounding terraces plus shower area. There is a good sized double bedroom on this floor with its own patio area and a WC off the entrance hall. Marble stairs lead to the upper floor and a very spacious master bedroom with its own Juliet balcony which has beautiful sea views. There is a very well finished shower room with a glass shower enclosure and also the washing machine. Patio doors from the hallway lead to the large upper terrace which has amazing views and a very comfortable seating area which overlooks the pool. This lovely property is extremely well maintained and the shared amenities are cared for by an excellent local property management company. What is the sum of five + two?